Jamaica's Elaine Thompson, left, and Germany's Gina Luckenkemper compete in a women's 200-meter heat during the athletics competitions of the 2016 Summer Olympics at the Olympic stadium in Rio de Janeiro, Brazil, Aug. 15, 2016. Day 9 of the Summer Olympics in Rio is underway, with 17 gold medals at stake. Monday's competition includes men's gymnastics medals being awarded for rings and vault. On the track, athletes will run for gold in the women's 400 meters and the 3,000-meter steeplechase, as well as the men's 800 meters. Women's football (soccer) also has its semifinal matches Monday with Brazil facing Sweden and Germany playing Canada. On Sunday, Jamaican sprinter Usain Bolt is still the fastest man in the world. 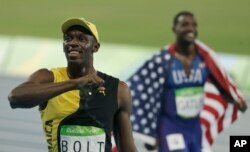 He won the men's 100 meters Sunday for a third consecutive Olympics, something no runner had ever done before. The victory ignited cheers from a huge crowd watching the race on a screen in Jamaica's capital, Kingston. Bolt still has more he wants to accomplish at the Rio Olympics where he is also trying to win the 200 meters and the 4x100 relay for a third time. "Stay tuned, two more to go," he said Sunday. "Somebody said I can become immortal. Two more medals to go and I can sign off. Immortal." Earlier in the night, it was South African sprinter Wade van Niekerk's turn to make history. He won the 400 meters in a world record 43.03 seconds, beating the mark American Michael Johnson set in 1999. Jamaica's Usain Bolt celebrates winning the men's 100-meter final during the athletics competitions of the 2016 Summer Olympics at the Olympic stadium in Rio de Janeiro, Brazil, Aug. 14, 2016. Van Niekerk had the disadvantage of running in the far outside of a staggered-start race, meaning he could not see any of his competitors. "I was running blind all the way,'' he said. “I thought someone was going to catch me, what's going on, what's going on, and it gave me motivation to keep on pushing." Van Niekerk won by more than seven-tenths of a second over Kirani James of Grenada, who took the silver medal. LaShawn Merritt of the United States won bronze. The home Brazil fans gave boisterous cheers at the men's gymnastics floor exercise final where their own Hypolito Diego won silver and fellow Brazilian Mariano Arthur won bronze. Britain's Max Whitlock won gold in the event and another Sunday in the pommel horse. On the women's side, American Simone Biles continued her dominance with a gold medal in the vault -- her third of gold of these games -- beating out Russia's Marika Paseka and Switzerland's Giulia Steingruber. Biles has a chance to win two more medals in the floor exercise and the balance beam. United States' Simone Biles bites her gold medal for the artistic gymnastics women's individual all-around final at the 2016 Summer Olympics in Rio de Janeiro, Brazil, Aug. 11, 2016. Russian Aliya Mustafina won the uneven bars Sunday, while American Madison Kocian took the silver and German Sophie Scheder the bronze. Golf returned to the Olympics this year after a 104-year absence and Britain's Justin Rose tapped in a short birdie putt on the final hole to clinch the gold medal ahead of Swede Henrik Stenson. American Matt Kuchar won the bronze. In tennis, Britain's Andy Murray won gold in men's singles with a 7-5, 4-6, 6-2, 7-5 victory over Argentina's Juan Martin del Potro. Kenya's Jelagat Sumgong won the women's marathon in a time of 2:24:04, nine seconds ahead of Kenyan-born Eunice Kirwa, who represented Bahrain. Ethiopia's Mare Dibaba took the bronze.